Boy, do I remember this game! The Sheridan Yellowjackets used a 77 yard drive to score the go-ahead touchdown with 2:33 left in the game as they defeated the White Hall Bulldogs by a score of 21-19 on Friday, October 23. White Hall received the opening kickoff but was forced to punt three plays later. 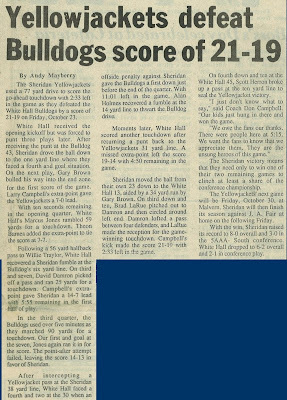 After receiving the punt at the Bulldog 43, Sheridan drove the ball down to the one yard line where they faced a fourth and goal situation. On the next play, Gary Brown bulled his way into the end zone for the first score of the game. Larry Campbell’s extra-point gave the Yellowjackets a 7-0 lead. With ten seconds remaining in the opening quarter, White Hall’s Marcus Jones rambled 59 yards for a touchdown. Theon Barnes added the extra-point to tie the score at 7-7. 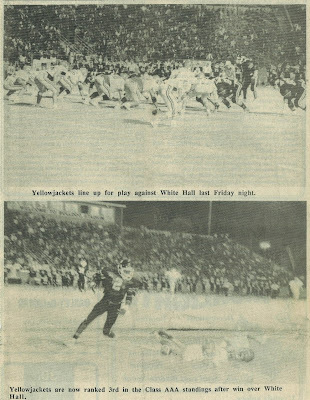 Following a 56 yard halfback pass to Willie Traylor, White Hall recovered a Sheridan fumble at the Bulldog’s six yard line. On third and seven, David Damron picked off a pass and ran 25 yards for a touchdown. Campbell’s extra-point gave Sheridan a 14-7 lead with 5:55 remaining in the first half of play. In the third quarter, the Bulldogs used over five minutes as they marched 90 yards for a touchdown. On first and goal at the seven, Jones again ran it in for the score. The point-after attempt failed, leaving the score 14-13 in favor of Sheridan. After intercepting a Yellowjacket pass at the Sheridan 38 yard line, White Hall faced a fourth and two at the 30 when an offside penalty against Sheridan gave the Bulldogs a first down just before the end of the quarter. With 11:01 left in the game, Alan Holmes recovered a fumble at the 14 yard line to thwart the Bulldog drive. Moments later, White Hall scored another touchdown after returning a punt back to the Yellowjackets 31 yard line. A missed extra-point left the score 19-14 with 4:50 remaining in the game. Sheridan moved the ball from their own 23 down to the White Hall 13, aided by a 34 yard run by Gary Brown. On third down and ten, Brad LaRue pitched out to Damron and then circled around the left end. Damron lofted a pass between four defenders, and LaRue made the reception for the game-winning touchdown. Campbell’s kick made the score 21-19 with 2:33 left in the game. On fourth down and ten at the White Hall 45, Scott Herron broke up a pass at the ten yard line to seal the Yellowjacket victory. “I just don’t know what to say,” said Coach Don Campbell. “Our kids just hung in there and won the game. The Sheridan victory means that they need only to win one of their two remaining games to clinch at least a share of the conference championship. The Yellowjackets’ next game will be Friday, October 30, at Malvern. Sheridan will then finish its season against J. A. Fair at home on the following Friday. With the win, Sheridan raised its record to 8-0 overall and 3-0 in the 5AAA-South conference. White Hall dropped to 6-2 overall and 2-1 in conference play. 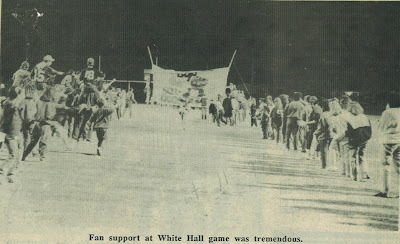 Fan support at White Hall game was tremendous. My dad and I sat in the end zone in lawn chairs because there were no seats in the stands. I was in Jr. high! This was the greatest Yellowjacket game ever.